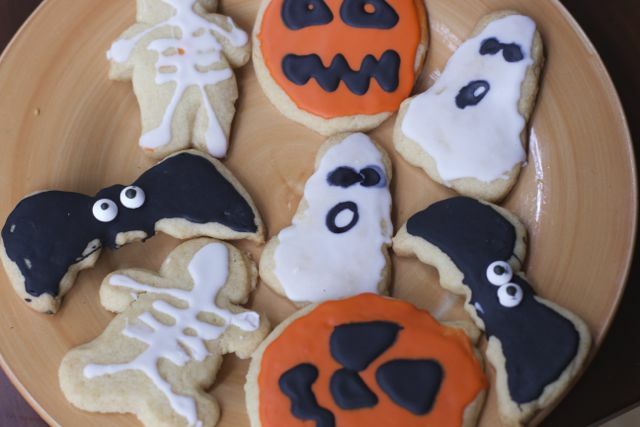 It’s never too early to make Halloween cookies. Sugar cookies are timeless and my family will eat them no matter what the theme!! 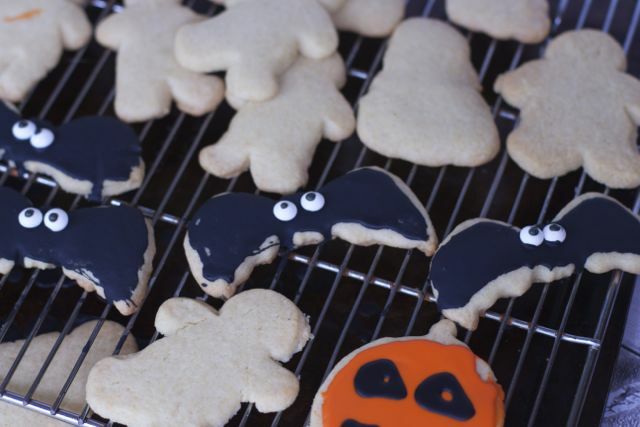 We were going through some old posts, like this one from 2010 and got excited to make more easy Halloween Cookies and add a little touch of making simple gift ideas to go along with them. 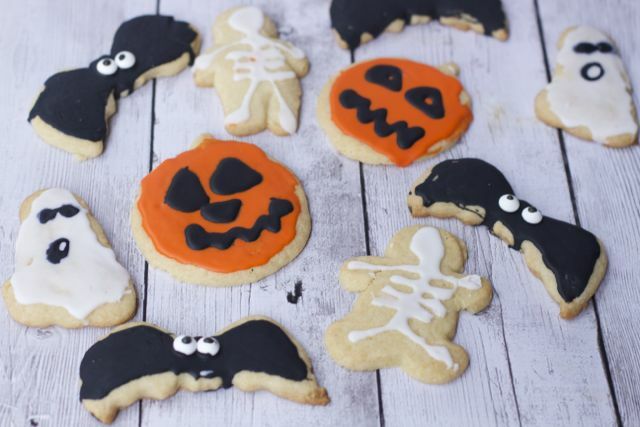 To get the Halloween season started with these easy Halloween Cookie and Cookie gift ideas that will make anyone excited for Halloween. I must admit I do cheat when it comes to making these sugar cookies. I use a packaged sugar cookie mix and cookie icing in a tube. Hey everyone is happier when mom is not exhausted making these cookies that will be devoured in one day. In my post from 2010 I used Gingerbread, but I like the idea of sugar cookie as most people prefer that flavor. Who said Gingerbread Cut Out cookies are only for Christmas? 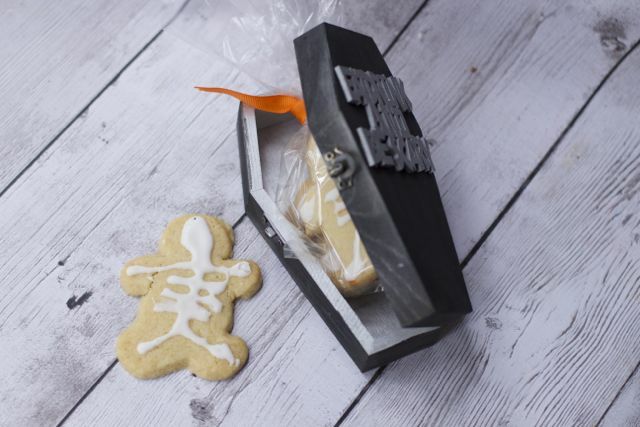 As I was looking through a gourmet food catalog years ago, I found a picture of a skeleton cookie and thought I can make that on a gingerbread cut out at home. 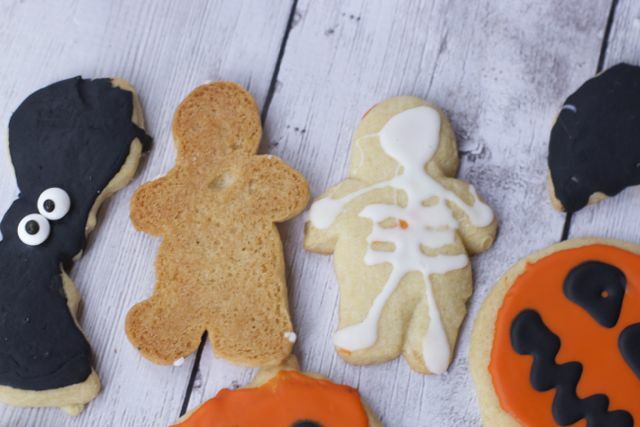 For the skeleton cookies, simply cut out the gingerbread boys. LOL , I just realized I forgot to take a photo of the before and after. To make the ghosts you can cut out a gingerbread girl and take off her arms or just form one free hand. 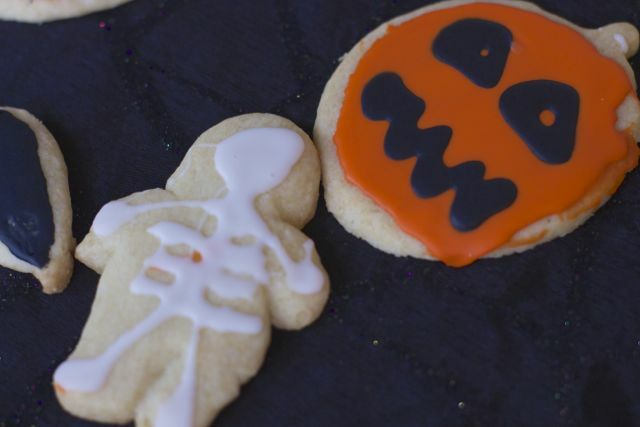 Decorating Halloween Cookies is always a fun kids activity. I have found the Wilton cookie decorating writers at both Target and our AC Moore Stores. For some reason I could not get them to stay very thick, so they were a little runny. This was a little disappointing. I might try these smaller containers of Wilton Fondant writer Fondant Icing Writers. Available at most craft and fabric stores. You could also write with these Wilton Fondant Icing Writers. For the bats I added these fun candy eyes. I think they make the bats pop! 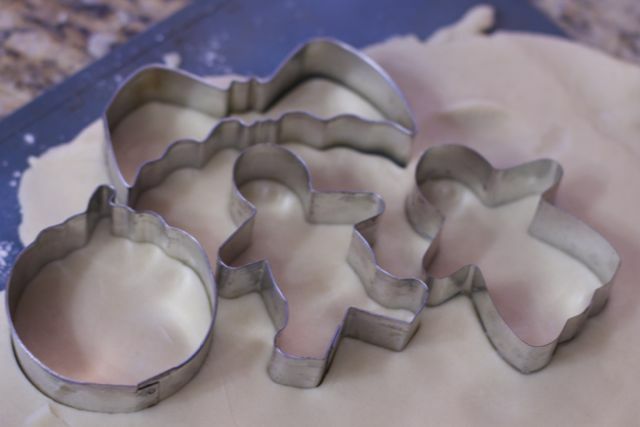 Just add them before the icing dries. Even though the glaze was runny, it was best to allow the base to dry then add the second color. I think these came out cute and they were quite delicious. 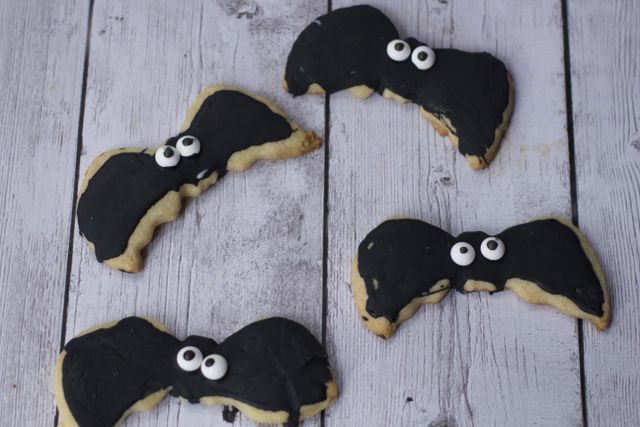 But why just put these adorable Halloween cookies on a plate. Why not give them to friends or teachers as Halloween Gifts? You might need to make a second batch or at least make them while no one is home!! 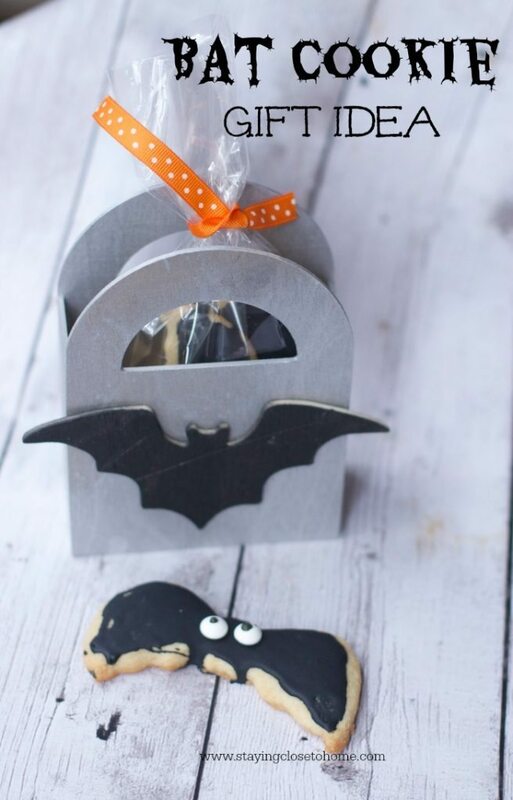 For these adorable bat cookies, we made a bat container. Using a $1 unfinished wooden container found at our craft store and a fun bat wood piece. We painted them. I had silver and black spry paint but you can choose any spooky colors you wish. Simply hot glue the wooden pieces onto the wood containers after they are dry. After everything is dry and the cookies are set, place a few cookies in a small cello bag. Then place them in the container. We found unfinished wooden caskets at AC Moore as well. 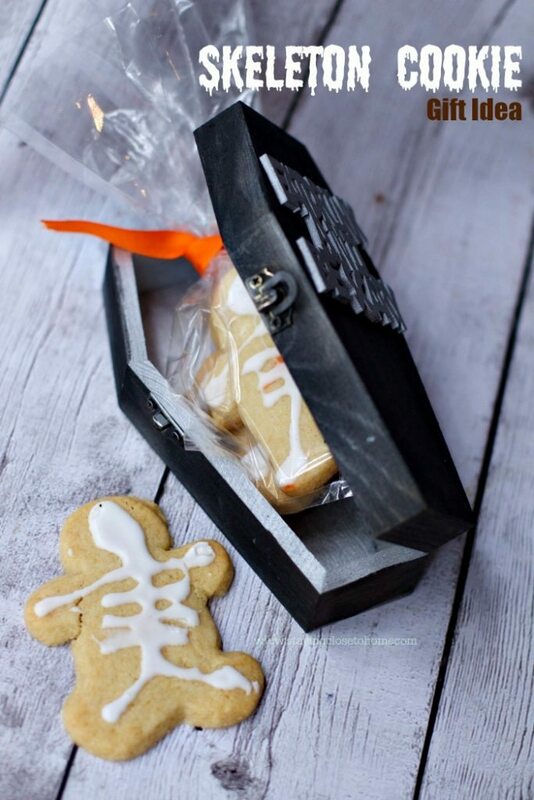 After a little paint job, these skeleton cookie gifts came to life. I am not sure which Halloween Cookie Gift I like better. 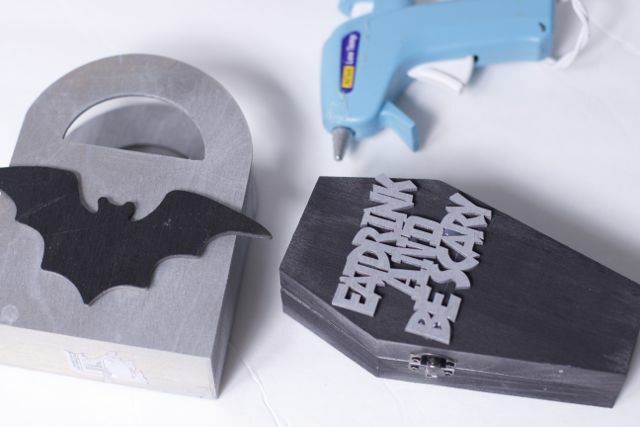 The wooden piece we attached says, Eat, Drink and be Scary. As you can tell we had a little fun with Halloween cookies. 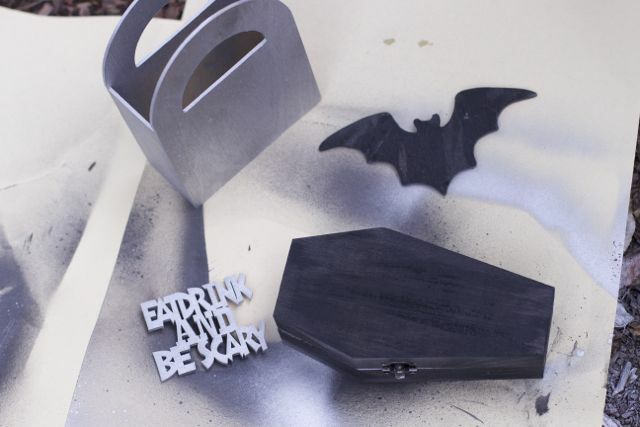 I hope you can get the kids involved to and make some of these adorable Halloween gift ideas. 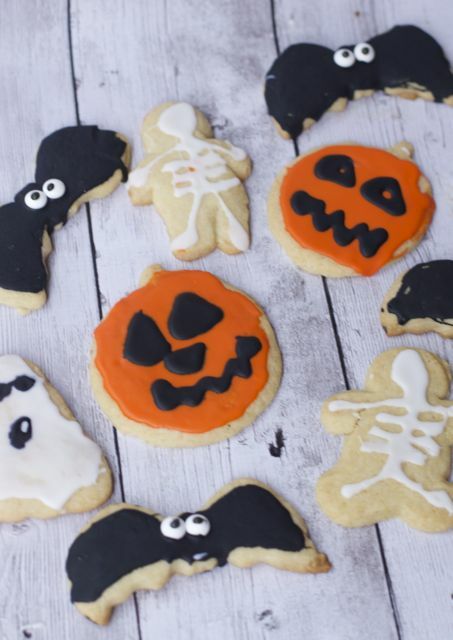 Which one of these Halloween Cookies is your favorite ? I’m partial to the skeleton cookies, and I love how the frosting looks on them! They’re adorable! thanks so much, it was fun making these Halloween Cookies too. 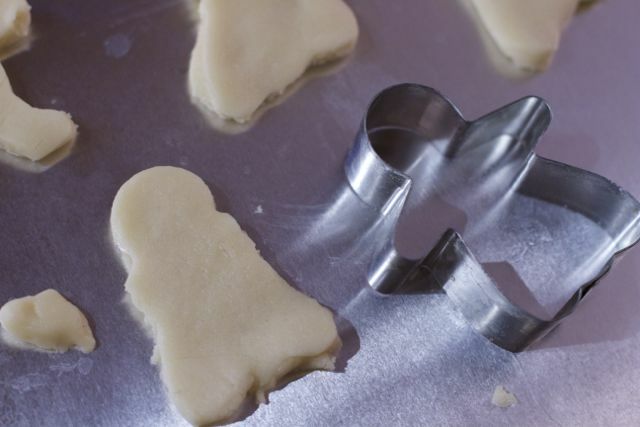 Adorable cookie cutters and gift ideas. 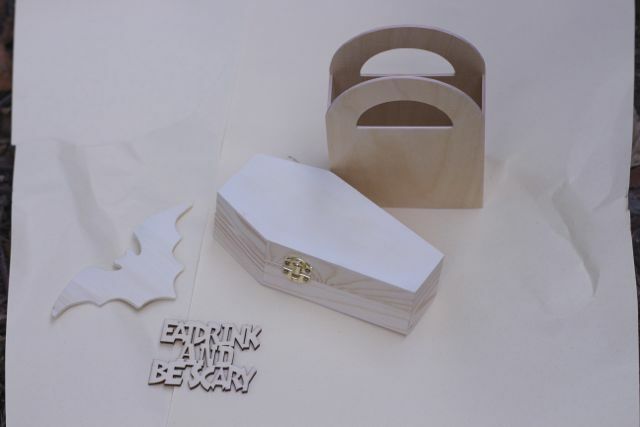 The coffin is fun!